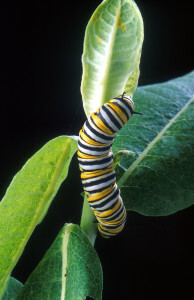 Are herbicides responsible for the decline in Monarch butterflies? Originally posted on Control Freaks: Wyoming Weed Science in (almost) Real Time blog. The monarch butterfly is in bad shape. The number of monarchs returning to their overwintering sites in Mexico has been declining steadily for at least a decade. The consensus suggests there are several reasons for this decline, including loss of their overwintering habitat and unfavorable weather patterns. But the purported cause of monarch decline that seems to get the most coverage is the loss of milkweed (Asclepias spp) in the midwestern US migratory path. The evidence seems clear that the number of milkweed plants through this region has indeed declined. The cause for the milkweed decline, though, is a little less certain. The same highly publicized study that documented the decline in milkweed numbers suggested that herbicide use in agricultural fields was the culprit. But the study didn’t control for herbicide use, and therefore, had no way of knowing whether it was actually the herbicide or something else associated with crop production that caused the decline in milkweed. They found a correlation between adoption of glyphosate-resistant crops and estimates of milkweed density in Iowa. Surprisingly, this limitation didn’t stop the authors from concluding herbicides were solely to blame, even titling the paper “Milkweed loss in agricultural fields because of herbicide use…” (emphasis mine). The “GMO crop kills butterflies” narrative is a nice fit for many anti-GMO and anti-pesticide groups. It is certainly plausible, and it makes sense that herbicides made to kill weeds would negatively impact native plants like milkweed. But a new study by USDA-ARS and Penn State scientists suggests what most scientists already knew: the real story is probably much more complicated. It is important to note this study is not directly aimed at finding the root cause of milkweed decline, but it provides information that is very relevant. And there are a lot of things to like about this new paper. The study presents a method to untangle a very complex problem, and this approach could be quite useful to other researchers. But I think what I liked most was that the authors took a very cautious approach to interpreting their results, which is truly refreshing given the topic. Even the institutional press release was very cautious. This study could have easily been over-interpreted to grab headlines, but it wasn’t. In short, if herbicides are to blame for the decrease in plant diversity in areas surrounding agricultural fields, then the plant species that have become rare must be more susceptible to herbicides than plants that are still commonly found. They tested this hypothesis on 5 pairs of plant species; 5 rare species paired with 5 closely related species that remain common in the same area. Two milkweed species were included in the study: Asclepias syriaca (common) and Asclepias tuberosa (rare). They sprayed each species in the study with glyphosate, the herbicide associated with Roundup Ready corn and soybeans, and the herbicide most commonly blamed for milkweed decline. They also tested 2 additional herbicides commonly used in Midwestern corn fields: atrazine and dicamba. Their data simply didn’t support the idea that herbicides are the primary cause of the decline in the rare species they tested. They even noted that in many cases, the rare species was actually more tolerant to the herbicides than the more commonly found species. The authors rightly note there are many limitations to their study. They only evaluated 5 genera and 3 herbicides, greenhouse studies are not always very representative of field conditions, and genetic variability was limited in their collections, among others. Does this mean herbicides have played no role in the decline of important species like milkweed? Certainly not. Egan’s research was not specifically aimed at milkweed decline, so we shouldn’t extrapolate these results too far. We shouldn’t take this study to be representative of all rare species and all herbicides. And they were only interested in the plants that grow near agricultural fields, not in them. But this research does suggest that there are more important factors than herbicides responsible for the decline of native plant species near crop fields, including milkweeds. Hopefully, the methods used by Egan et al. will be used in future studies that focus primarily on milkweeds and other plant species that now reside in the areas where milkweed has become less common. This would help us unravel the real reasons for the decline in milkweeds. Until then, perhaps we should focus less on trying to blame Monsanto for the decline of the monarchs, and instead start actually doing something that could help bring them back. Egan, J.F., I.M. Graham, and D.A. Mortensen. 2014. A COMPARISON OF THE HERBICIDE TOLERANCES OF RARE AND COMMON PLANTS IN AN AGRICULTURAL LANDSCAPE. Environmental Toxicology & Chemistry. Updated 11-Feb-14 to clarify importance of agricultural vs non-agricultural fields.